I am back from the exclusive bloggers drive organized by Tata Motors and Indibloggers at Kochi, Kerala. 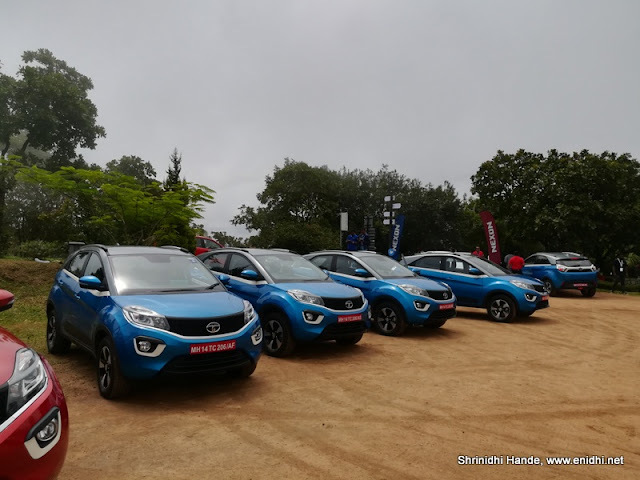 I am sharing my findings about Tata Motor’s new baby- Nexon in 3 parts. Part 1 will cover its salient features (this post), part 2 will cover our driving experience and part 3 will provide acomparison of Tata Nexon with its competitors. 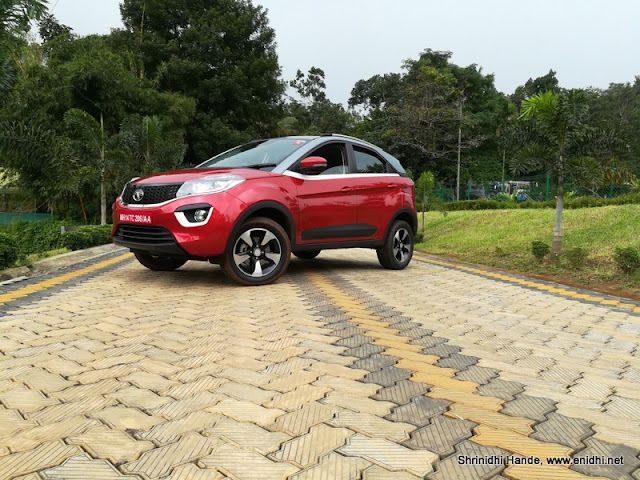 The new Tata Nexon- Looks and Features. By now you’ve seen enough photos of Nexon on the internet and have fair idea of its looks. Still my review won’t be complete if I don't add some of my observations. When I had originally seen Nexon pics on the net, I thought it is just a Bolt on elevated platform. But as more pictures started coming in and when I finally saw the Nexon in flesh, the beauty of its looks was impressive. 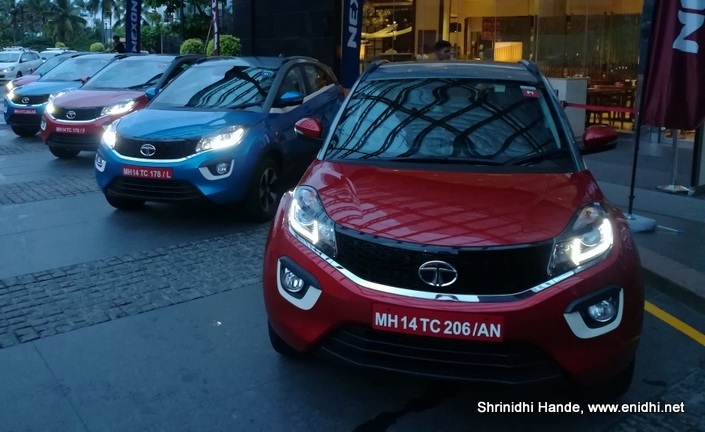 For the first time Tata Motors has introduced dual tone body colours (actually there're 4 colours in total- blue/red main body colour, gray roof, white waitline and a black outline on the doors) While other manufacturers use lots of chrome in these spaces, Tata has used paint/plastic for the effects. Only one chrome stripe is used-in the front facia)- blue bottom and gray top, red bottom with gray top part, separated by a distinguishing waistline. This well thought colour combination has managed to grab eyeballs and attract lookers on to it. C pillar seems to slope little too early, trying to offer a coupe like design. 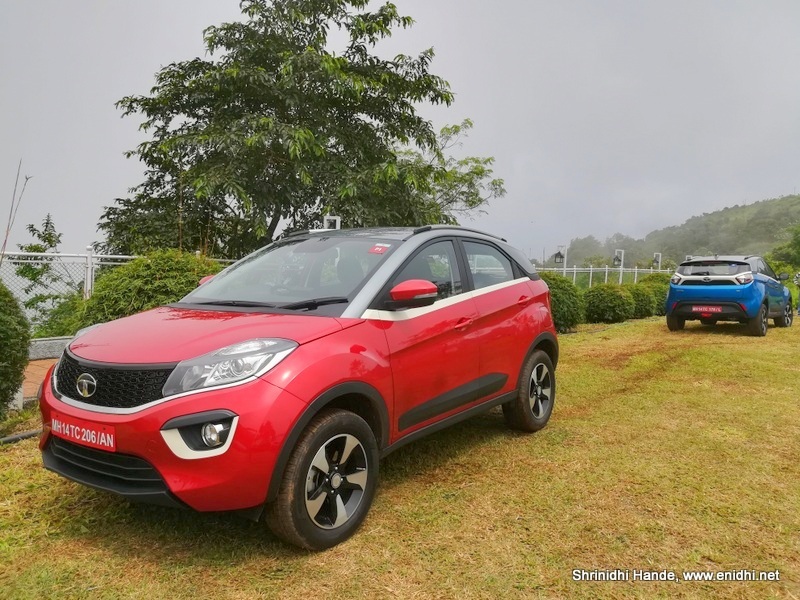 This is where Nexon stands apart from its competitors who have a more boxy design. 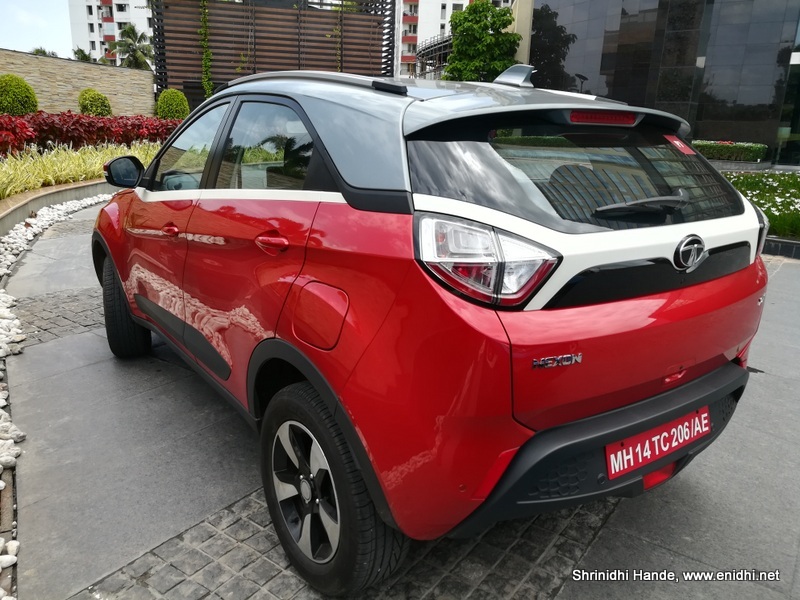 On the side, the 209 mm ground clearance is apparent-buyers can afford to add a side step if they chose to. 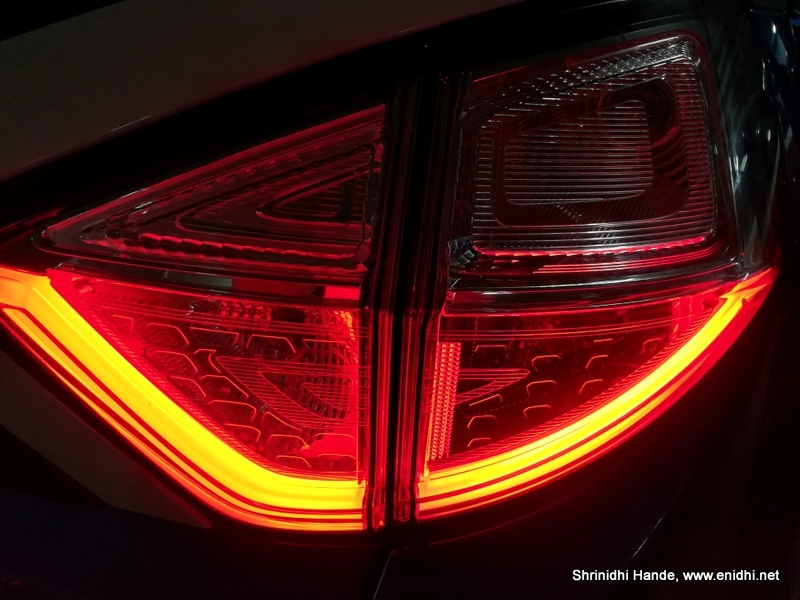 If you notice carefully there is a thin black lining between the door and roof-beginning near the mirrors and extending all the way till the end towards tail lamp- this is referred to as "Slingshot Line". White waistline separates the top n bottom portion. 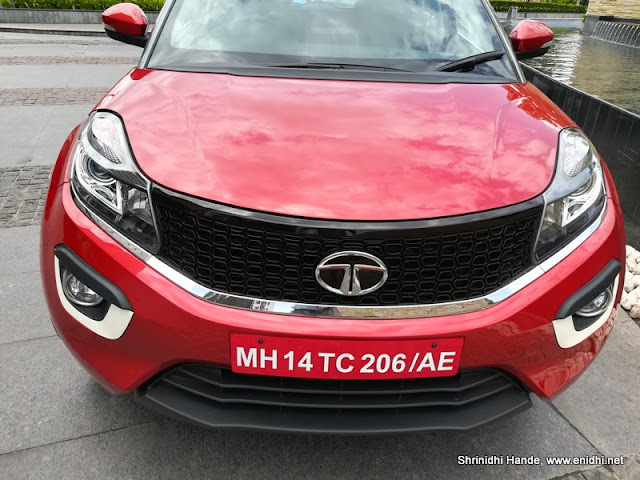 16 inch tyres are standard in its category, but with 215mm width, Tata has gone for wider tyres that should give more grip and control. Little bit of black rubber padding is added to minimize damage to paint. Door handle involves a small black button that needs to be pressed for keyless entry. 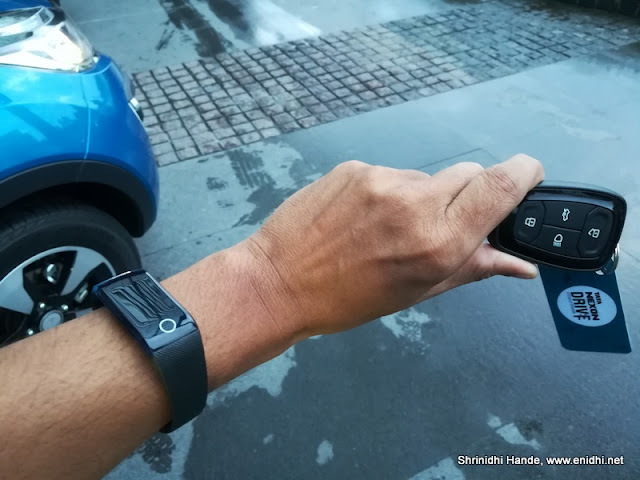 Speaking of keyless entry, Nexon top end variants will get a wrist band that can be worn. With this band on your arm, you can simply walk into the car, press the push button to start and zoom away. 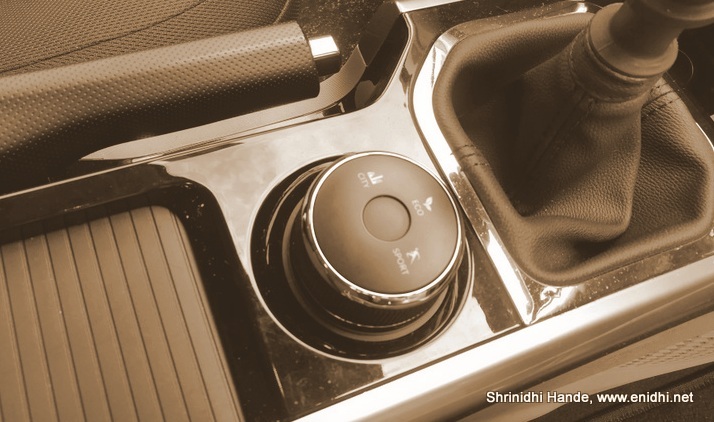 Very convenient when you prefer to move around hands free- like while jogging. Wrist band has no display whatsoever- showing some info like time/fitness measures etc can be some enhancements that can be considered for future. Who is the prettiest of all? 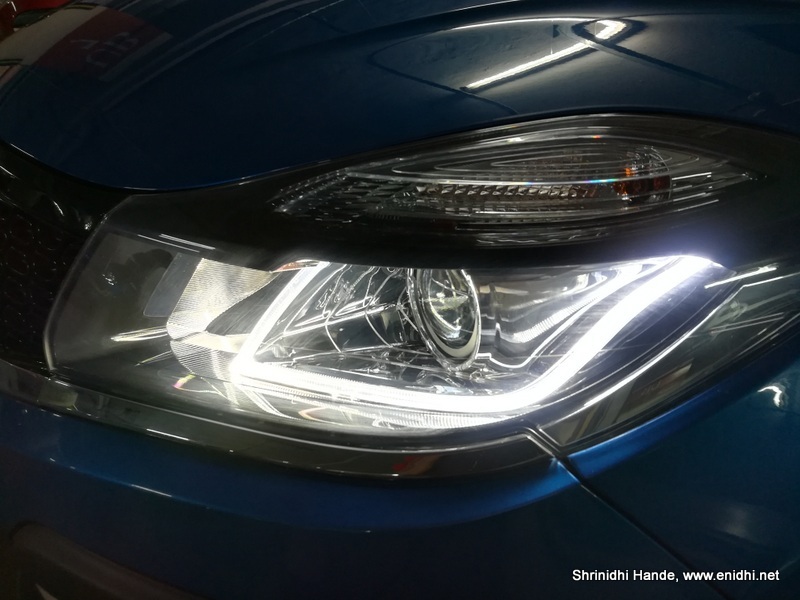 Headlamp assembly is all new, not reused from other cars, with a halogen lamp, DRL and turn indicators. 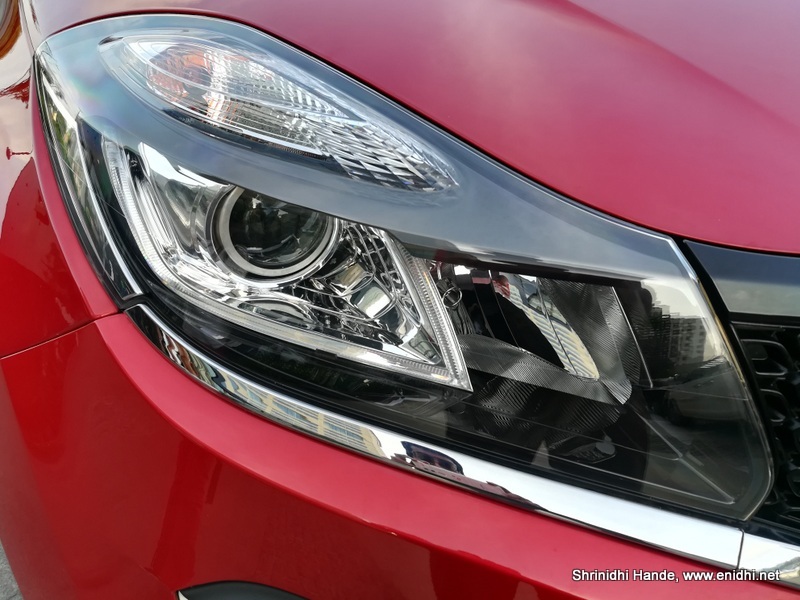 DRL is named "Feline Eye Shaped". Fog lamps get a black eye brow and white skirting, feels like two extra eyes!- during future face lift this space could be used for some DRL or redesigned lamps. Front grille is now familiar to everyone- 3D Tata logo on top of a honeycomb mesh. Only piece of chrome on the exterior can be seen here, referred to as "Humanity Line". Rear is where lots of attention has been paid to- the signature white waistline beautifully covers the rear part separating top and bottom portion, wrapping tail lamps on one side. A kind of X shape. 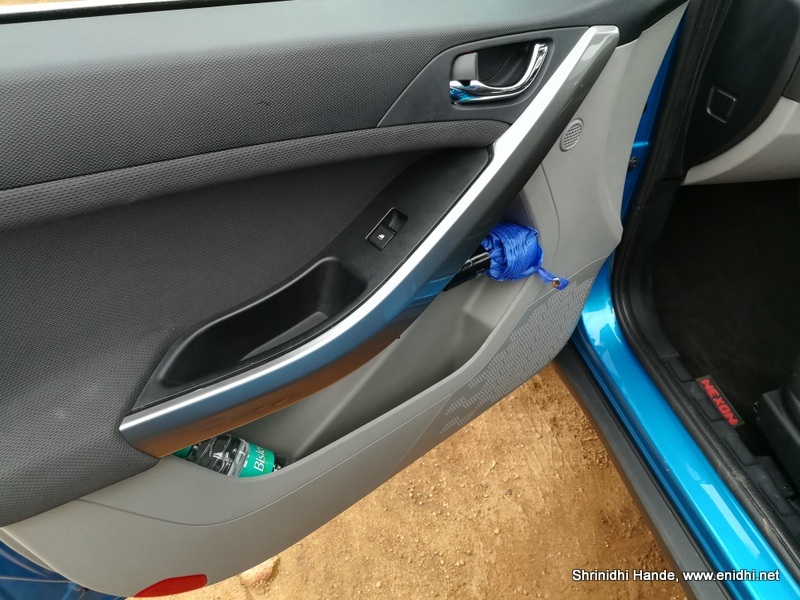 Door handle is positioned at the bottom-for taller people some effort will be required to open the boot. 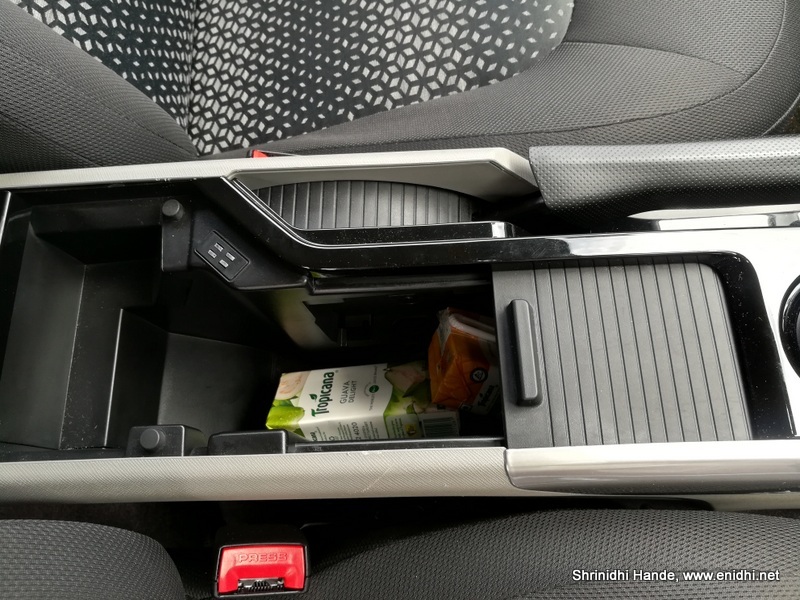 (many compact SUVs/MPVs have boot door at chest level, which doesn’t require much effort to pop open). Also key fob gets a boot release button- which only unlocks the boot- doesn’t pop it open. Opening the boot need to be done manually. Only a small single exhaust pipe can be seen. 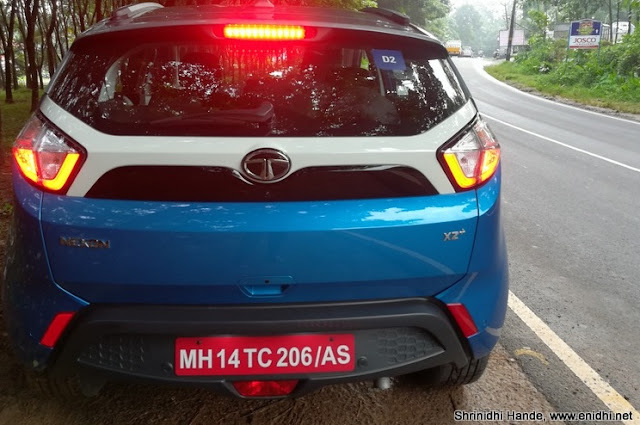 No attempt has been made to include dual exhausts integrating with rear bumper, like in Hexa. 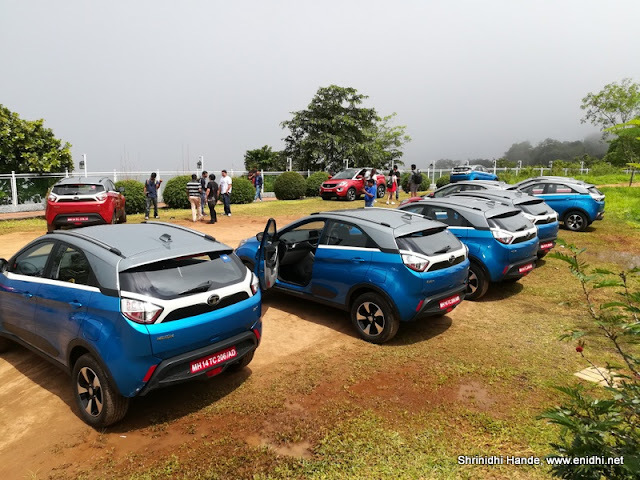 There’s a shark fin antenna that is not very common in sub 10 lakh cars and a skyrack to add to the looks. 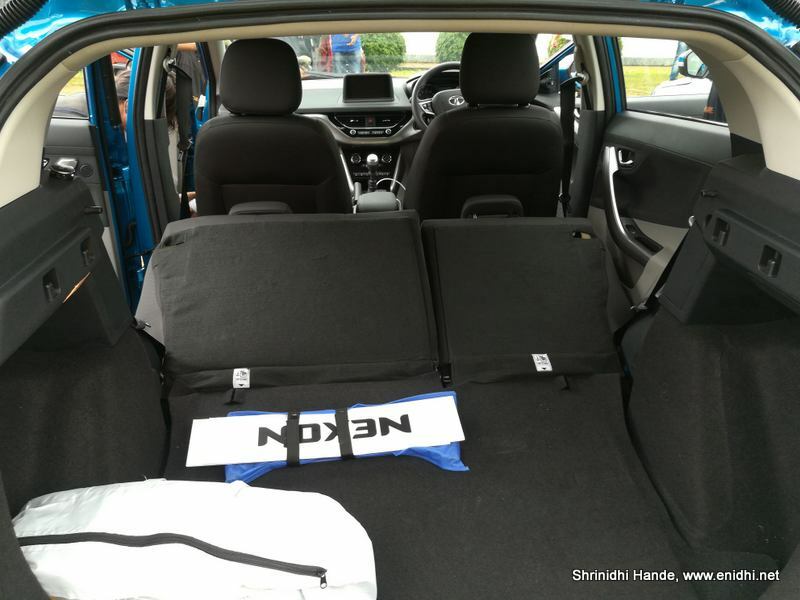 Lots of cool features are packed inside Nexon, along with nice premium feeling interiors. Don't expect all of these to be available on all variants- details of which will be known only during commercial launch. 1. Sliding Tambour Door: A small storage area next to driver’s seat is provided with a sliding door. Feels very premium and cozy. 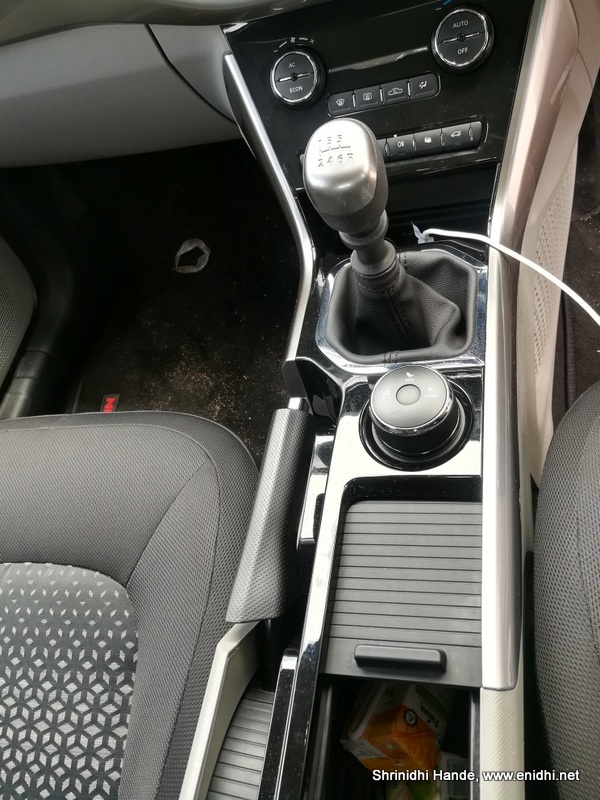 Hand brake moves slightly to the right because of this. The finish is superb- shiny and smooth, feeling very premium. Very responsive Engine, rapid acceleration, top speed but fairly compromised fuel economy. 3. Start/Stop button: Push button start/stop button is a cool way to start/stop your engine. Can be done in any gear but pressing clutch pedal is mandatory. 4. 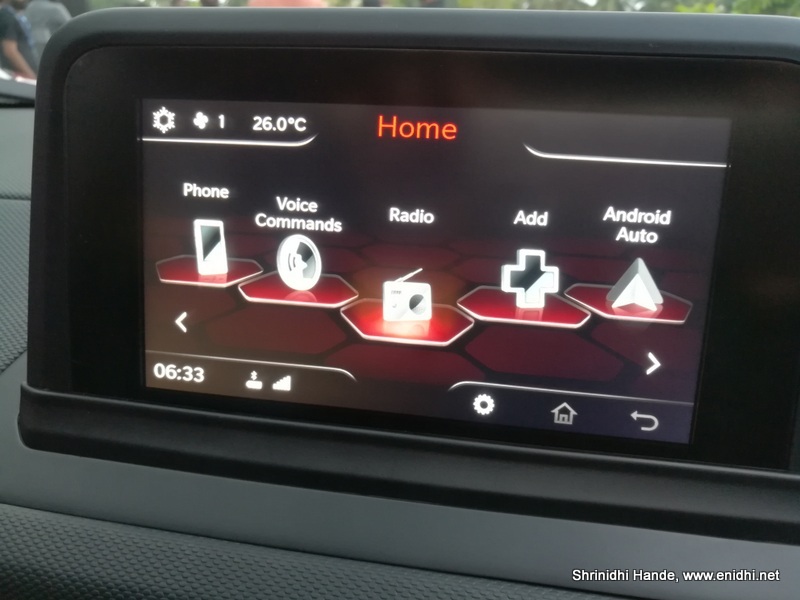 Freestanding/dashtop 6.5” infotainment system: Like in some Audi & BMW models, the touchscreen infotainment system stands tall on the dashboard rather than getting engulfed at the centre of it. This positioning makes it prominent, easy to see (say maps) etc. No, it is NOT possible to fold or retract or tilt it. The position is fixed. 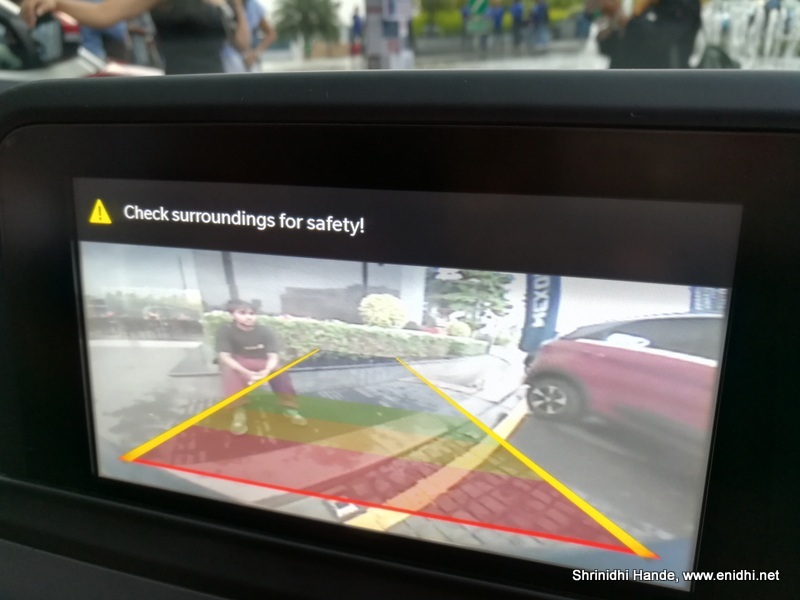 Reverse camera with guiding lines engage automatically on reversing, can be flashed on demand as well. 6. 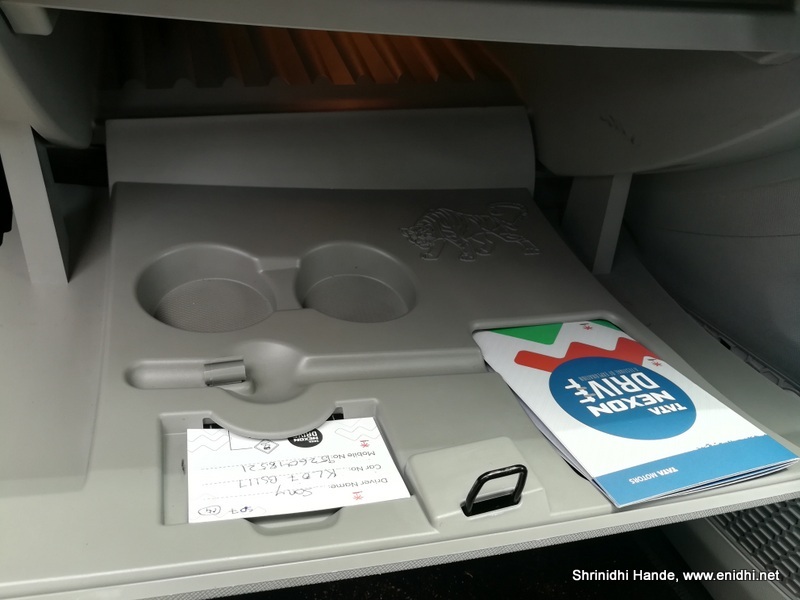 31 Utility spaces all over the car, including umbrella holder, spectacles holder (with velvet clothing) etc. Holding large 1/2 litre bottle in the door can be tricky, but they fit well inside. 7. 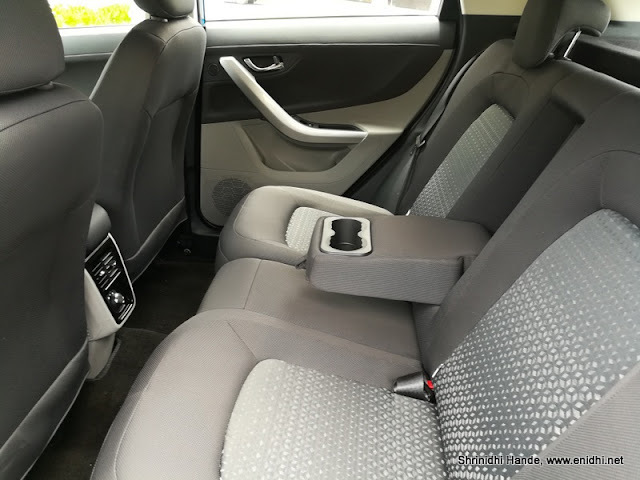 Second row with middle armrest + cup holder, AC vents with blower control and adjustable headrest. Seats are almost bucket like, pretty comfortable. Designed with a family of 4 in mind, the 3rd person in second row will have some compromise. Also second row seats don't move front/back. Fabric quality is also fine. 8. 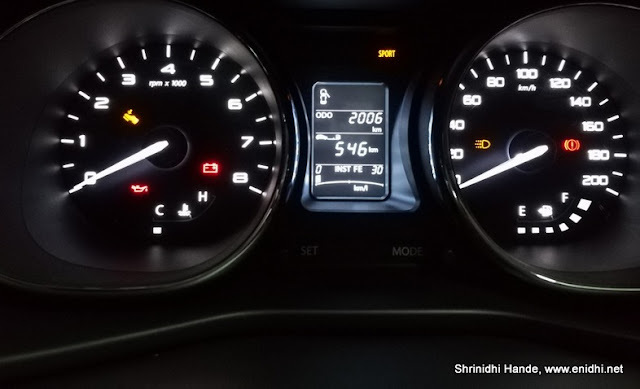 Instrument cluster is the familiar one- indicates outside temperature, which exact door is open, DTE, average fuel economy and a host of other information. Many car makers are moving away from giving push button rods on the console (to change mode or reset trip meter)- like Figo gets it on the turn indicator instead. Something for Tata Motors to consider for future improvements. Notice below that car is showing a distance to Empty of 546 km, with full tank fuel (diesel, 44 litres). This translates to around 12.4 kmpl. This is in Sports Mode. If driven in Eco, I guess one can expect 16-18kmpl. 9. 350 litters boot space-fold second row and you will get 690 litres space. Second row splits in 60:40 ratio for varied seating/space combinations. This space is better than rivals. 10. Climate Control: Climate control feature is included in Nexon. 11. Auto adjustable and auto folding mirrors: External Rear view mirrors can be auto folded at the press of a button. Some of the features available in some of the other 7-10 lakh price range cars, not available in Nexon: Rain sensing wipers, windshield that can keep interior few degree cooler, hill hold control, additional airbags, follow me home lamps, control to roll up/down windows through remote, even when engine is switched off. 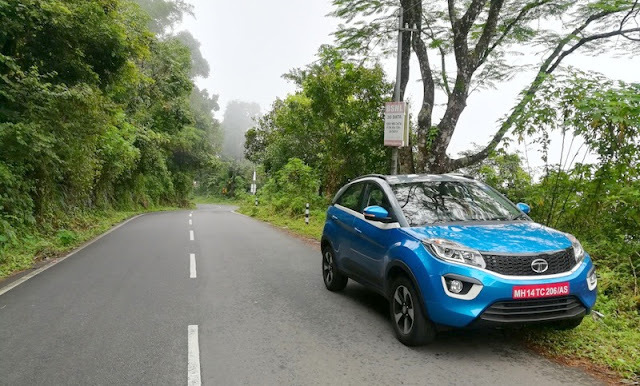 Overall Nexon is a brilliant package of looks, features and engine options. No complaints as such. 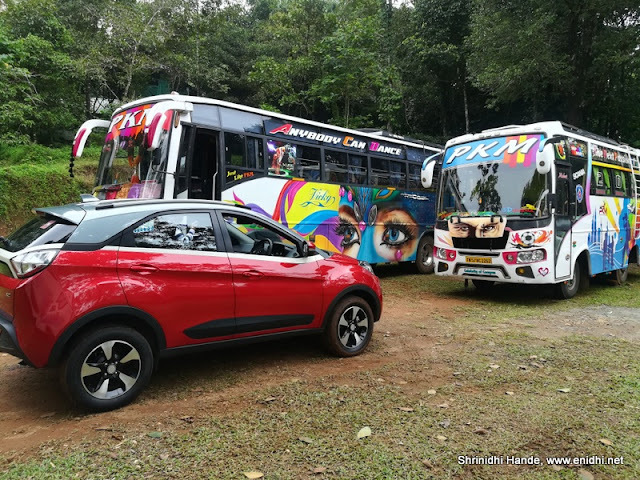 For engine details and driving experience, please check the other post. Read Karthik Murali's review here. Battle of Bikes-OnnBikes vs Royal Brothers! 2018 Long weekend list-start planning! Pros and Cons of visiting Thailand in Monsoon! Tata Nexon vs Vitara Brezza vs Ford Ecosport!